Russian film director Kirill Serebrennikov is competing at the 69th Venice Film Festival in Laguna, attempting to repeat Aleksandr Sokurov's 2011 Golden Lion success with his film ‘Izmena’ (Betrayal). He talked to RIR about movies, Russia's film industry and art. Kirill Serebrennikov does not particularly like film festivals. 'I don't feel at ease. I only relax after the screening of the movie,' he says in his blog. But the Russian director does not seem at all uncomfortable on the red carpet at the 69th annual Venice Film Festival. Surrounded by reporters and photographers, Serebrennikov arrives at the Lido on the wave of expectation that follows Aleksander Sokurov's Golden Lion triumph last year with the film ‘Faust’. Sokurov is a tough act to follow, even for Serebrennikov, who is admired at home for his amazing ability to combine classical stories with original, extravagant revisions. He has done this over the years with numerous theatrical productions, receiving critical acclaim in 2006 when his ‘Izobrazhaya zhertvu’ (Playing the victim) won at the first annual International Rome Film Festival. Now the challenge moves to Venice. It may prove difficult this time around, now that the impressive ‘Faust’ has raised expectations among those who love and follow Russian cinema. 'Italy is a country that brings me luck,' he confessed, almost crossing his fingers and adjusting the white cap pulled down on his head. 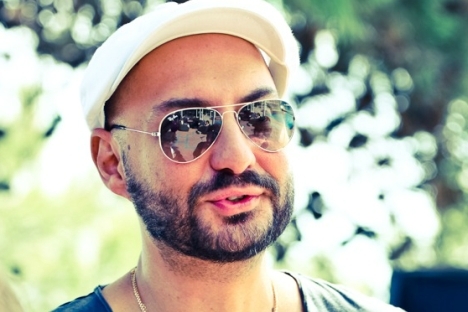 Russia & India Report talked with Serebrennikov about Russian movies and his achievements. Russia & India Report: This is not your first film festival in Italy. What is it like for you being here in Venice? Kirill Serebrennikov: I won in Rome in 2006 with ‘Izobrazhaya zhertvu’. But this is my first time here in Venice. For me it is a great joy. There is an excellent program, beautiful movies and amazing organization. RIR: Do you feel the stress of having to somehow compete with ‘Faust’ by Sokurov? K.S. : Absolutely not. There should be no competition in art. And above all, it is not something measurable: you cannot calculate how much better the Sokurov ‘s films are. Art is subjective. RIR: Do you know the other two Russian directors here in Venice, Aleksey Balabanov and Lyubov Arkus? K.S. : Of course I do. They are very good directors. Aleksey Balabanov has been one of the most successful directors on the Russian film scene for many years. All of his films are very well-known. And he creates films that are intelligent and touching. K.S. : I am familiar with the older film directors, those who have made history. I love Fellini, Pasolini. But if I had to name my favorite Italian director, I would say Visconti, without a doubt. RIR: Getting back to the Festival, who do you think will win the Golden Lion? K.S. : I won't deny that I am rooting for us to win; obviously I support Russian cinema. But if they do not award the prize to Thomas Anderson, I swear I'll jump in the pool right now (laughing). RIR: Why did you decide to direct a film about infidelity? K.S. : With this film I meant to explore myself and the human race in-depth. I wanted to study one of the many aspects of love, to find out how people react when faced with such difficult situations. This is just one of the many aspects of love, mind you. Obviously it is not the only one. There could be many other things to say and tell. RIR: Perhaps there is one thing that this film has in common with your previous film, ‘Izobrazhaya zhertvu’: the transition from being the victim to being the offender. Is that how it is? K.S. : Indeed, I would say so. In the previous film it was obvious. But it is also perceptible in this film. Nowadays, the line between victim and offender is very thin. It is easy to cross over to the other side. RIR: What are your thoughts on the future of cinema? K.S. : Speaking about the film industry, there is no doubt that, in the coming years, we will still be very much attached to Hollywood and Bollywood: for the simple reason that these are vast systems of production, which China will soon also contribute to. But if we are talking about the cinema as art, then we need to invest more into it, keep the cinematic traditions alive. I believe that investment from the government in this field is very important, because it would automatically become an investment in culture, like the Louvre, the Hermitage or the Uffizi. This would obviously also apply to theatre.